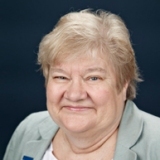 Diane has been the Chair of Information Technology and Cybersecurity at Marymount University for eight years; She manages a series of programs for undergraduate and graduate students. As of now, her team of students includes about one hundred graduates and two hundred undergraduates. Beginning as a chemist, Diane eventually went into labor science and then into computing chemistry. She is an incredibly creative person, a problem solver and exceptional at thinking outside of the box, as she enters the end of her work life, she is beginning to think about how she wants to spend her time; In the next four to five years, she would like to be a philanthropist in stem education; she firmly believes it's important for young people to understand the importance of technology; Diane believes that as you get higher in your field, credibility is important; She enjoys mentoring people and having them come to her for knowledge; Diane feels that her work in chemical emphatics in the 1970's has been her most significant work yet.